Sandestin Golf and Beach Resort is located on Northwest Florida's Emerald Coast between Pensacola and Panama City, eight miles east of Destin. Of all the Southeast Florida resorts, Sandestin Florida Golf Resort offers the most desirable year-round sand, surf and golf vacation experience for families and groups. 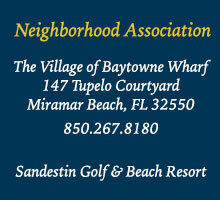 The 2,400-acre Sandestin Golf and Beach Resort is the premier destination in Northwest Florida. Sandestin is the only resort in the area situated on both the Intracoastal Waterway and the Gulf of Mexico.